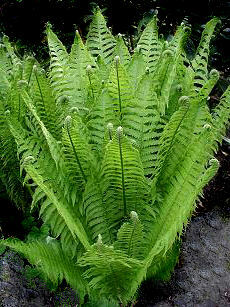 An exceptionally attractive fern, especially in the spring when the new croziers unfurl. Fronds a wonderful fresh green with persistent fertile fronds during winter. Will spread to form a colony with its underground rhizomes which can be easily lifted to increase your stock. Best in moist-damp soil in partial shade.